I really wanted one of those days where everything just clicked. Don’t we all hope for that at every race? I didn’t have that – not even close – but I still had an amazing time at this race and as usual learned a lot! The course was everything people described it to be (almost). There was plenty of climbing which meant plenty of descending. The course was completely runnable. The views were absolutely stunning. The only thing I did not expect were the stairs – so many stairs! We talk about the stairs at Cayuga Trails 50 because they definitely stand out at that race. I couldn’t help but wonder if TNF 50 had an equal amount of them. They were wooden railroad ties, and not as steep as Cayuga, but there were so many of them. Up and down. I actually enjoyed them for most of the race – at least going up. It was a very chilly start for me – leaving the hotel at 3 am the air felt perfect but once we got to Marin Headlands it felt considerably cooler. Luckily The North Face supplies fire pits at all of their races. I squeezed into one and up against the guy next to me. He apologized and gave me room to get closer to the fire before I explained to him that I was invading his personal space to share his body heat, after which he thoughtfully obliged J I was regretting my decision to leave my arm sleeves back at the hotel. I was regretting my decision to skip buying a pair of throw-away gloves the day before. I arrived in CA on Thursday feeling like I was hit by a train. I had one day to pull it together and an easy detour to buy some gloves while I was out seemed too daunting a task. Everything would be better once the sun came up. I felt oddly relaxed leading up to the start. I’ll chalk that up to feeling like I had properly prepared for this race. 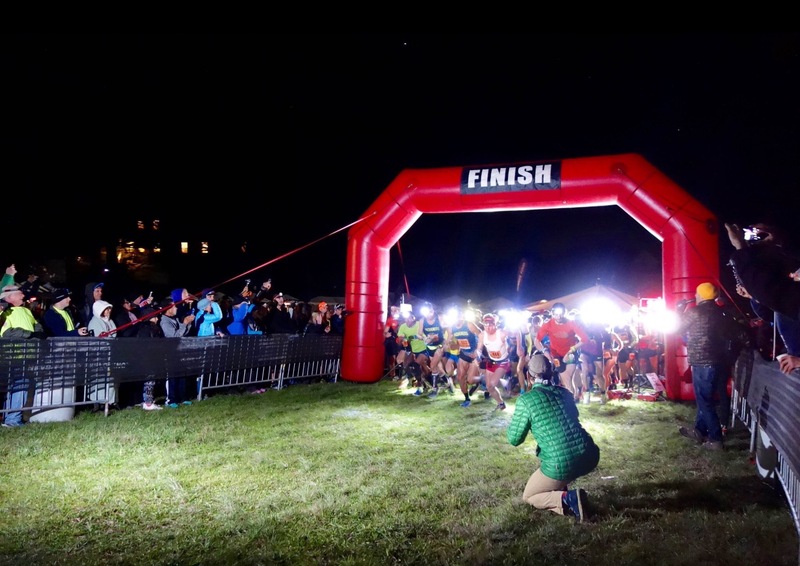 As the first wave was moved up to the start line I was looking for people I knew in the crowd to position myself with but it was dark and there was so much bustling energy I couldn’t figure out who was who. I was happy to see a fellow PA runner Jonathan Lantz next to me and it was comforting to know that he was going to be on the course with me today. Fellow Strong Hearts Vegan Power teammate Ellie Pell was with me as well ready to tackle her first 50 miler. The start command was shouted and we shot off into the darkness. It wasn’t long before I noticed Magda in the lead group of women so I settled myself in behind that pack to get a feel for how things would go. The pace felt really comfortable for those opening miles even as we went up and over the first climb of the day. The lead group of us shot right past an early turn and luckily the field behind us started shouting. It felt like Black Rock 25k déjà vu as we corrected ourselves and quickly tried to get back in front of the pack. As we hit that first descent that’s where I realized my weakness – the lead women were bombing down the hill while I was trying to stay conservative – it was only mile 4! I was able to catch back up as we bypassed the first aid station but once we started that second climb they began to pull away and I thought it would be best to let them go. Time to run my race. After dropping into Tennessee Valley I grabbed a cup of water and finally felt like I was settling in. However I was still really cold. 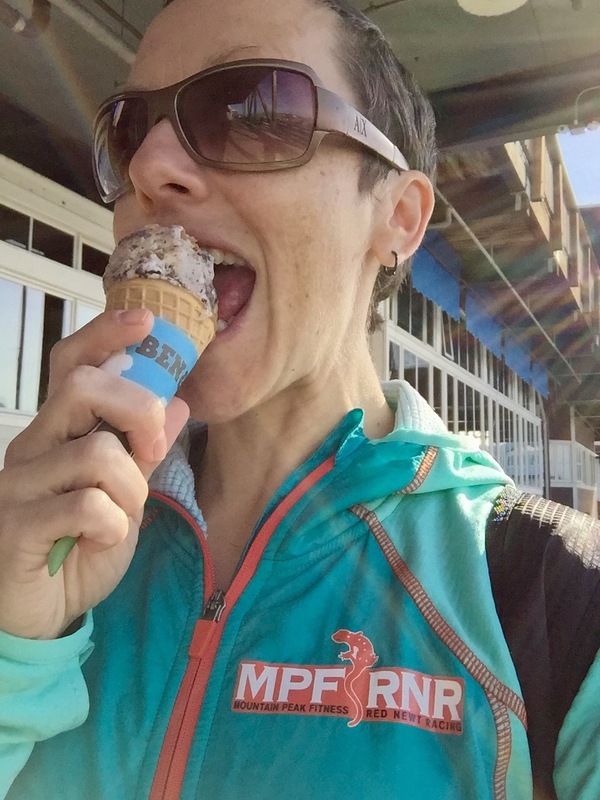 It was difficult to eat because I had no feeling in my fingers, but what bothered me more was my legs – especially my hamstrings and quads – feeling cold, stiff, and tight. I found myself focusing on how much better I would feel if I would’ve worn capris. I kept telling myself that once the sun came up I would warm up and everything would feel better. It was still pitch black and sunrise seemed so far away. I was being a big baby and spending too much time thinking about things that were out of my control. The best I felt all day was miles 10-15. I was sitting in 8th at the time but as we started the long climb to Cardiac my legs were again feeling so tight and weren’t cooperating. I knew I needed to grind out this 9 mile climb to McKennan Gulch where I could turn around and get some relief with the descent. I had dropped 3 spots to 11th by the time we hit Cardiac and as simple as that math was I was so mentally frustrated I thought I was lucky if I was in top 20. Don’t ask me how I couldn’t pay attention to something so simple – it shows that my head was not in the game. The high point was seeing the lead men come through between Cardiac and McKennan. Zach Miller was out front moving like a freight train and I was super-excited to see him doing his thing. We both cheered for each other and he encouraged me by saying I was “up there” and then shouted “Go PA” as he made the turn heading down to Stinson Beach. Pennsylvania pride is strong! Existing in my negative head space I laughed to myself about his “up there” remark thinking he was trying to be nice. 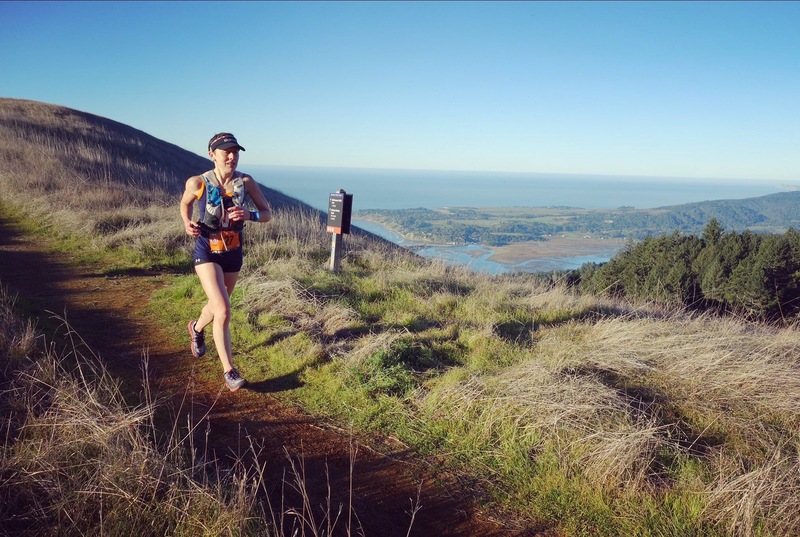 Frustration ran deeper as I hit the turnaround and made my way back down to Stinson Beach. This should’ve been a spot where I could open it up a bit and make up for that long uphill trudge. But I didn’t feel any better. Again my legs weren’t cooperating – the sun was up and I was still cold. I couldn’t shake this stiff feeling and my mental state worsened as I realized I was only halfway through the race feeling this terrible. There was no way I was going to give up but I started to have that talk with myself that this would be a race that I just need to finish. On this out-and-back section I got to see some familiar faces which helped to elevate my mood. Karen Holland, Leah Maher who I only met that morning but is also from PA, and Anne Bouchard whom I raced with at TNF Toronto. Everyone was smiling and looking strong and I used that energy. I was anticipating seeing my new friend Sandy who was crewing me at mile 29.4. I looked at my watch and realized I would be getting in right around the time I told him to be there and he had to take a shuttle which I know can be unreliable. I kept my hopes high that I would see him but on Friday I was already mentally preparing myself for the possibility of not getting my hydration and nutrition at mile 29.4. I rolled into the aid station at 9:06 and Sandy was nowhere to be found. I spent way too long standing around hoping he would magically appear – my backup plan thrown totally out the window due to my mental state. Finally I realized I had to move on so I slowly filled my bottles with water, grabbed a chunk of banana, and went on my way. Out of the way of the aid station I took another break to properly hack up all of the fluid in my lungs and clear my nose which I had only been half-successful doing while running. I looked up to see a poor, innocent bystander hiking towards me as she asked with concern “are you okay?” Sorry lady – no one deserved to see that. It was a short run to the Cardiac aid station so I got my head together and realized that I would need another plan for electrolytes and nutrition now that I did not have my stash. I also had the attitude of “I’ll eat and drink whatever the f*ck I want because it doesn’t matter anymore.” I was a ray of sunshine. 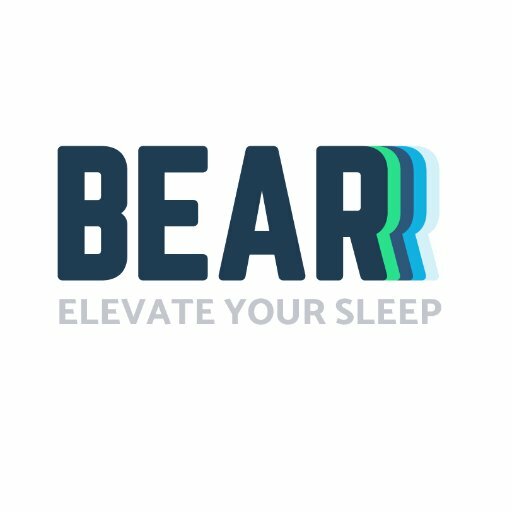 I arrived at Cardiac and grabbed a cup of Coke – yes Coke – and chased it with another chunk of banana because nothing else looked good to me and I remembered how bananas saved me in Switzerland last year. In a matter of minutes I felt a rush of life come into me. Huh. I guess it’s true what they say about that nasty, poisonous, rocket fuel. My whole damn attitude was turning around and at one point I actually yelled out “Coke” in an effort to praise my new-found savior. We dropped into Muir Woods and the beautiful redwoods. It was invigorating. We were now on the course with the 50k runners and I was definitely utilizing their energy. It was great to have people around and people to pass since I had been on my own for so long. 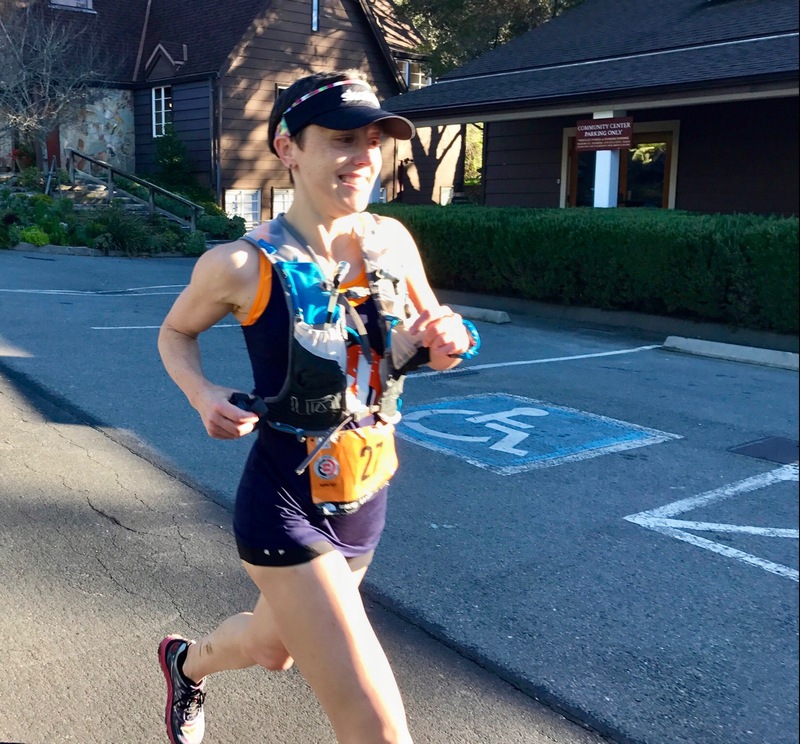 Then I passed a familiar face – Team USA (duathlon) teammate Elizabeth Sponagle was tackling her first 50k and she looked great. I was so excited to see her as I was bounding down the trails with my new-found energy. Not too long after that I heard a loud scream of “NOO!” up ahead and I see the guy that I had been running near for most of the day hiking back up the hill. He said we were on the wrong course but I was sure we were going the right way and told him the same even though I had stopped in fear that we had done something wrong. 50k runners confirmed for us that we were heading in the right direction so we started up again. He said to me “you’re my beacon of light – every time I think something is going wrong I turn around and see you there and know everything is okay.” I appreciated his kind words but laughed and told him that wasn’t the wisest plan. He doesn’t know my track record. 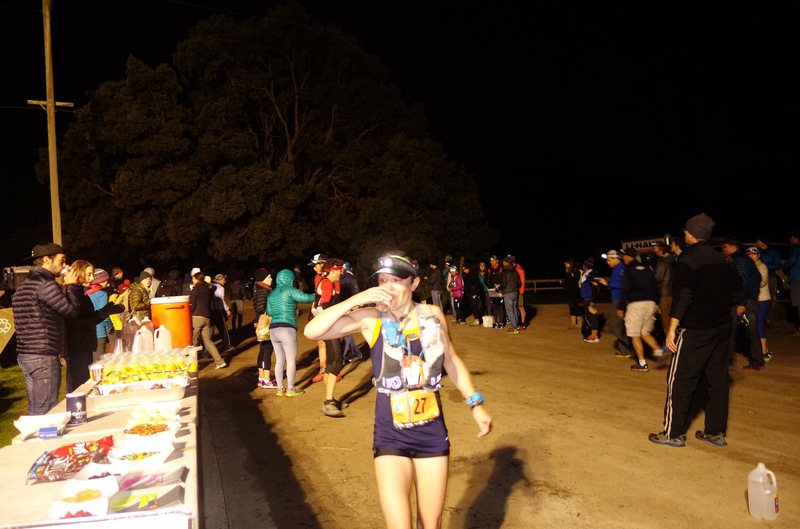 I recalled what one of my training partners texted me before the race: “Remember the race doesn’t start til 35!” I wanted to respond “It’s TNF50 – the race starts when the gun goes off” but I knew what he meant. And I remembered it now because at mile 35 I was finally starting to feel like I could race. Just at that moment I came across a spectator who told me I was in 11th. Who is this lunatic who doesn’t know how to count? I shouted back a very skeptical “what?! ?” and he confirmed that the 10th place female passed through about 10 minutes ago. I said “well…damn!” and thanked him for this info which was the first I received regarding my placement the whole day. Into the next aid station I grabbed another cup of coke, another bite of banana, and a handful of Clif Bloks to ensure I was getting enough calories. I was looking forward to reaching Tennessee Valley as I was sure Sandy would be there this time with my bottle of go-go juice to get me through the final 10k. I had one more climb to tackle before that point and then only one more left in the race after that. The downhills were starting to hurt more and more so once you reached the top of the climb you wanted to celebrate only to realize the real pain was about to set in. I could see Tennessee Valley and the huge crowd awaiting as I made my way down and worried about how I would find Sandy. As I approached the aid station my head was swiveling back and forth along the crowd that lined the road only to see Sandy standing right in front of me, arms waving with bottles in hand. I was so happy to see him and he spouted so much encouragement. I wanted to hug him but there was no time to linger. I gave him my vest and grabbed my hand-held before hitting the aid table for another piece of banana and heading up the final climb. I caught up to Jonathan at the aid station and was really excited to be with him for this final push. As we were hiking this climb I turned around and was certain I saw another female with an orange bib. Panic set in. I held my position for over 20 miles and I wasn’t about to give it up in the last 10k. I turned around one more time to confirm she was there and it certainly looked as if she was. 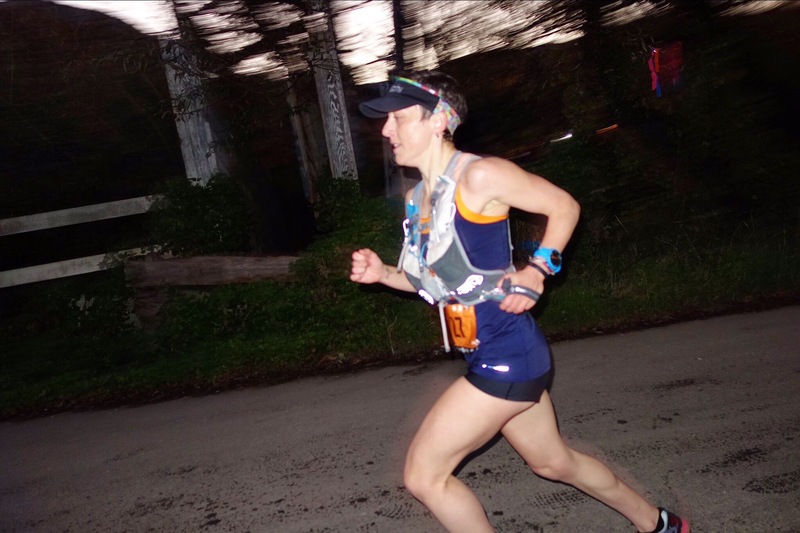 I made two decisions: 1) I would not turn around again for the rest of the race – I would go as hard as I could, and 2) I was going to get up this last climb through equal parts running and hiking. Being the obsessive counter that I am I started a 25 x 8-count cycle of running/hiking until I made it to the top. Another painful downhill but knowing it was the final descent I pushed a little harder. Again we could see far ahead on the course to where the trail leveled out so I focused on that spot – knowing that once I reached the bottom I could open it up. With about 2.5 miles to go I could hear someone coming up on me. Then I could tell it was a female. Another moment of self-defeat as I thought “I can’t believe I let this happen”. As she pulled alongside me I looked over to see her bright-colored bib and told her “great job” even though I didn’t recognize her. That’s when she said “I’m a relay and I can barely catch you – you’re so inspiring!” Her bib was red, not orange! Phew! She had a strong pace and I was determined to stay with her so that’s exactly what I did. I ran alongside her for those final miles with her encouraging me the whole way – she was so awesome! She said I was inspiring but really she was the one who inspired me. She was in her own race yet she dedicated herself to pushing me those last miles talking me through it the whole way. I hadn’t looked at my watch in quite some time so when I rounded the corner to the finish line I was happy to see that I had met my goal of finishing under 8 hours. I gave my finishing partner a hug and thanked her for her kindness. I wanted to quickly grab my bag so I could get my phone to capture Ellie’s finish and as I was exiting Sandy was waiting to congratulate me. It was so awesome to have him there. 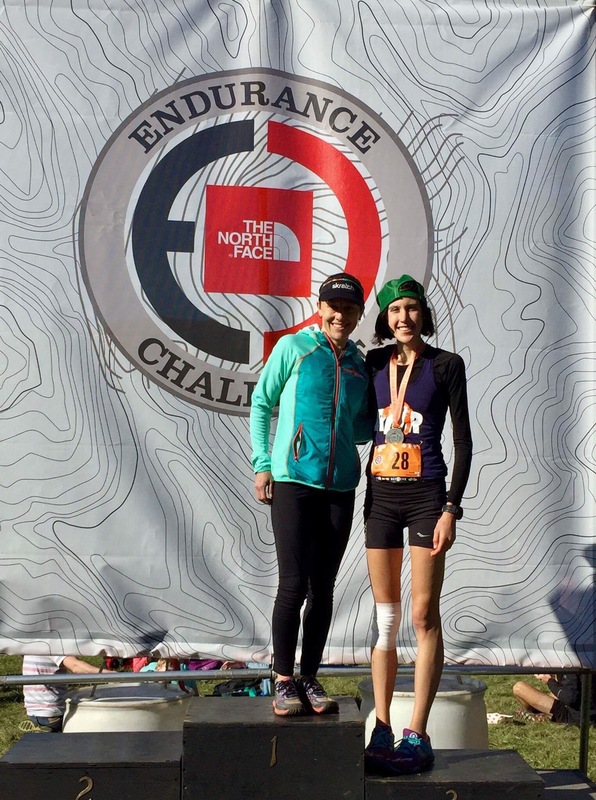 Turns out getting my bag was quite the ordeal so sadly I missed Ellie’s finish as she came hobbling over to me crying tears of happiness after executing an amazing race – placing 15th in that field at her first 50 miler ever! Of course since the race ended my mind has been in a constant state of ‘what I did wrong – what I need to do better’. But that’s how we grow right? It was a great experience to be racing such a strong field of competitors on a truly enjoyable course. The weather was perfect and I finished without any battle wounds or injuries so I couldn’t ask for anything more. Onto the next one! Scott Field of Keystone Bodywork who spends countless hours keeping my body tuned and making sure everything is firing properly. Even though I swear at him a lot and wonder what I’ve done to make him hurt me so, I know that his thumbs and elbows are giving me love. Jay Friedman my steadfast training partner who never missed a track or hill workout. Even on those dark sub-freezing mornings he was there to pull me along and keep me in check. Oh and hey, he’s in the running for RunUltra Blogger of the Year so vote for him here! Sandy Naidu who offered up his Saturday to a complete stranger by crewing for me at the race. I’m so happy I got to meet and spend some time with such an awesome person and I will definitely take him up on his offer to crew me again in the future! And of course I have to thank Jonathan Levitt for bringing the two of us together. And finally Topo Athletic for providing me with the shoes that kept my feet happy all year long. Yet another race without a single blister or any pain in my feet. A special thank you to Kristine David who, when the replacement shoes I needed for this race were not available in my size, sent me her own personal brand-spanking-new shoes so that I had a fresh pair for race day. Now that’s service!